Excellent book! The topics are organized, detailed, clear and simply put; easy to read. The screen shots are very helpful. The difference in our first book is drastically different from our next one, thanks to reading Book Formatting for Self-Publishers. You can really see we followed a professional’s example. 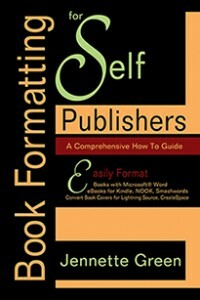 Even though I was a novice, I was able to turn a basic word document into a professional looking book. Thank you for putting all your hard earned knowledge together for the rest of us. I really appreciate it! This is my reference manual from now on.